Dawson is VERY excited about Christmas. 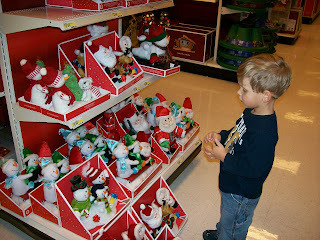 He loves going to the store (mainly Wal-Mart and Target) and seeing all the Christmas decorations. 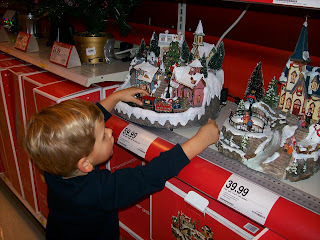 Most children want to go to the toy section, but Dawson prefers the Christmas section. 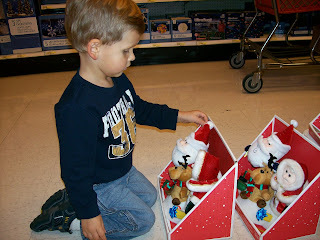 He especially likes pushing the buttons on the musical dolls and watching them sing and dance. Checking out the musical villages. He really likes those with trains, like the one in the picture. Enjoying the Santa and Mrs. Clause musical dolls. So many buttons to push!